First off, I want to tell you how much fun I had on this field trip. It's not everyday that you get to go and dig for fossils with a paleontologist. It was a blast. Anyone who is given the opportunity to go on any trip like this should take it. You won't regret it. Now, before you can dig up your fossils, you have to find them, and you might be asking yourself, "how can I find some fossils?" The first part is easy, you do a little research and find out what areas have a surplus of bones. 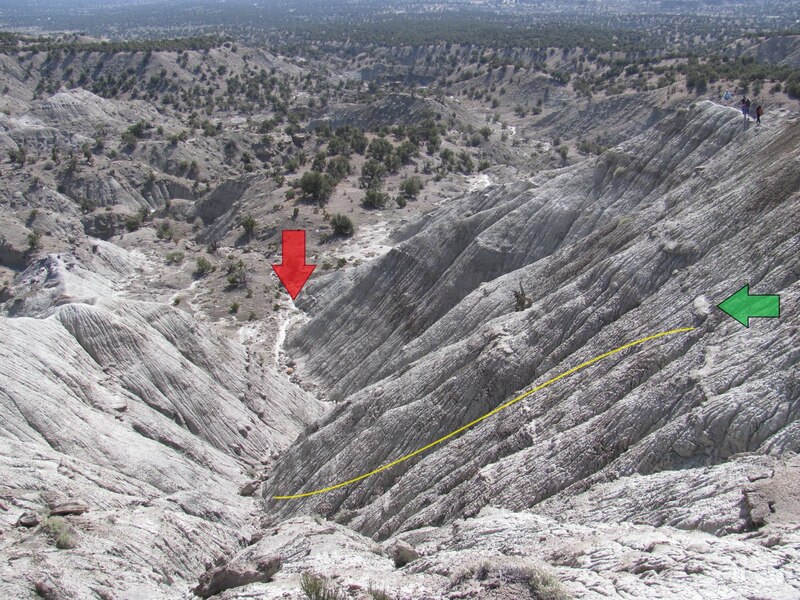 As you'll read from some of the other posts, the Grand Staircase National Monument is full of them, especially around Cretaceous layers. Anyway, when you find a good area, you will need to look in the right places. If you look at the picture I have here, you will notice that there are lots of little valleys like this one. Because of continuous erosion, this is the best place to look. As the layers are being washed away it will cause pieces of the bones or other fossils to come loose. They will travel down the slopes to the bottom of these valleys. (notice the red arrow) So you'll want to walk around the bottom or at the top were they could just have started to become exposed. Make sure you have a hand-lens at the ready to use if you think you have found a fossil. In this area the bones tend to have an orange "rusty color", look for that. Also if you think you have found a piece, look at it with the hand-lens and check for a porous area in the middle. Bones have these porous area inside because of the bone marrow that would be inside when the animal was alive. One last test that you could do is lick it. Yes I said 'lick', like with your tongue. Because the bone is porous, the bone will slightly stick to your tongue. Once you've found a piece, you'll want to travel up the hill from where you found it, because they travel downhill because of gravity. On my picture, you will see a yellow line, this would be if you had found a piece at the bottom of the hill and then followed the line up-hill to find more bone. You will know where to start digging when you have found the highest piece of bone, because it won't travel up hill. Through my experience in searching for bones, I have noticed that they tend to be around the harder layers that appear in the slopes, indicated with the green arrow. So as you look, look for these layers of harder sandstones and mud-stones. But, you must be aware that taking any bones from a public land illegal. If you find anything of value, tell the park services, who knows, maybe they will name a new species of dino after you. On the trip, I was looking for bones as I have described above, and I found some pieces of turtle shells. It turns out, after looking around some more, that we had found an area that the paleontologists call a turtle dam. There was once a river that ran in the Cretaceous that had logs that had gotten stuck, and so turtles would get stuck in the logs and die. This is why we had found so many parts of turtles and petrified wood all over that area.